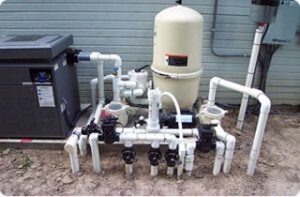 From time to time if you have a swimming pool you may experience pool pump prime issues. Dealing with these issues can be troublesome so we have created a list of items that should be checked. Common indications of a pump that’s unable to prime are when there isn’t any water flowing through it when it’s on or when there is a lack of suction or a lack of pressure within the filter tank. During these times use the below to help you resolve the issue. If you experience issues in lack of suction when vacuuming from a single pipe like the skimmer or vacuum line try cracking open the main drain pipe or any other. Cavitation can form on some pools plumbing causing a lack of suction when it’s directed 100% to one pipe. Allowing another pipe to gain some suction allows more water to flow into the pump keeping prime on all pipes and maximizing suction. Another cause for lack of suction from a skimmer port while vacuuming is an Ozonator. Check to see if the pool has an Ozonator and if so try adjusting the ball valve for the Ozonator that’s on them. Or, take the small plastic tube off the Ozonator and plug it with something to prevent air suction on the pipe as a temporary measure or kink the pipe while you test for increased and constant suction on the skimmer line. If the ball adjustment doesn’t work but the plug or the kink of the pipe does work then there’s an issue with the Ozonator. If there are two pumps of the same kind swap their lids around and see if the other lid gets the pump primed. If so make sure the good lid is on the main filter system pump and leave the other lid on the other pump if it’s just for a water feature or spa that’s not as important as the filter pump. Check to see if filters need cleaning or have possibly gone bad. This can be done by removing the cartridges completely from the tank and put the tank back together and run the system without the cartridges. If prime dramatically increases then the filters are bad and restricting water flow. If you can get the pump running but suspect it will not prime back up after the pump goes off then remove the “Off” pin so that it will continue to run preventing the pool from going green and enable continued filtration or use the automation controls to keep the pump on. If the pump has run dry try pouring a bucket of water into the pump may get it primed manually but it may not come back on automatically the next schedule. We hope this helps you get the pump primed again and back able to enjoy your pool. This entry was tagged green swimming pool las vegas, Henderson pool pump, Lack of suction, pool pump, pump prime, swimming pool filter cleaning, water level. Bookmark the permalink. ← Pool pump prime issues troubleshooting guide.